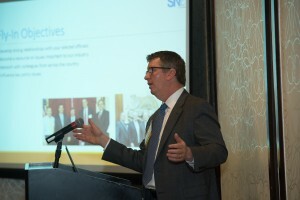 With guidance from Michael Torrey Associates, SNAC International hosted its annual Legislative Summit. 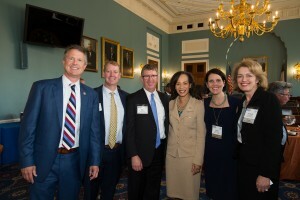 During the meeting, SNAC members received a policy issues update from the MTA team, met with over 100 Congressional offices, and attended the “SNAC Attack” Capitol Hill reception hosted by the association. SNAC members represent over 400 small and large snack industry suppliers, marketers, and manufacturers worldwide. The Legislative Summit provided the state-of-play on current legislative, regulatory, and trade issues. Michael Torrey Associates presented during the Fly-In Breakfast Briefing, providing updates on several issues including the farm bill, trade, immigration, transportation, and labeling standards. MTA also shared best practices to have a successful Hill meeting and build relationships with policymakers and their staffs. “Always treat a staff member like you would the Member,” said Mike Torrey during his “Lobbying 101 Presentation”. “Oftentimes schedules change and lawmakers aren’t always able to meet with us. The way you interact with staff does make a difference.” Check out more of MTA’s Lobbying 101 tips here. After the briefing, attendees took to the Hill and discussed transportation issues (such as the DRIVE Safe Act,H.R. 5358), labeling concerns and the 2018 farm bill. MTA staff joined SNAC at over twenty such meetings in both chambers. Congressman Roger Marshall (R-KS-1); Jon Hixon, Yum! Brands; Michael Torrey, Congresswoman Lisa Blunt Rochester (D-DE-At large); Jessica Hixon, SNAC International; and Elizabeth Avery, SNAC International at the SNAC Attack Congressional Reception. Michael Torrey presents to members of SNAC International at the Legislative Summit. MTA’s Barbara Patterson joins SNAC members in meeting with legislative staff from Congressman Danny Davis’ (D-IL-7) office.